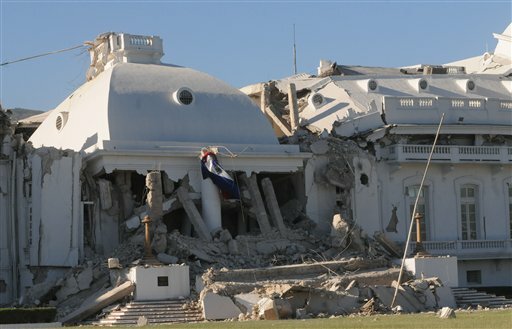 Haiti’s National Palace – which houses national offices and is the Haitian president’s residence – is now destroyed. Today I found out from friends at our former church that our pastor friend Jay Threadgill and his daughter Taina are alive and okay in Haiti, as well as most of his church staff, praise God! Pastor Jay’s wife Linda is in the U.S., safe. Pastor Jay says that Haiti is devastated. Markets, banks, houses, and banks have collapsed, and death is everywhere. Medical attention is desperately needed. The first day, he tried to help dig out bodies buried alive. Some people are still trapped alive, underneath the rubble. Pastor Jay’s church will need rebuilding. Pastor Jay’s school is damaged but repairable (broken glass, broken computers, etc.). The school’s soccer field has been turned into a tent city, and they’re going to begin feeding people today, with prayers that there are no riots. They have a limited amount of food. He is planning a possible open air church service soon, so people can gather together, pray, and encourage each other. The greatest needs are food, water, fuel, medical assistance, and finances. He believes the port and customs are probably closed right now, but heard reports that a hospital ship and aircraft carrier may be in today. I emailed pastor Jay today to let him know that Ray and I are praying fervently for him, his family, and all their needs, and are going to send financial help. If you would like to contribute financially to pastor Jay, here is his website, Fishers of Men International-Haiti. His church’s email is Info@FOMHAITI.org. Please keep them and the people of Haiti in your prayers. My heart was going out to them today seeing the graphic news. Some of the people with head injuries and other injuries can’t even be operated on yet, and many people are homeless. There is nowhere to put the dead bodies (which may be up to hundreds of thousands), so people are piling them on the streets. One of the greatest risks now is disease from the dead bodies, unclean water, etc. People are frightened and traumatized.